Audiences going in to Bad Times At The El Royale waiting for some big third act reveal like Drew Goddard’s previous film The Cabin in the Woods should probably temper their expectations somewhat. Goddard, like his previous film, is riffing on a bunch of cinematic tropes, but instead of deconstructing the horror genre, he’s basically deconstructing the American Dream, and he’s doing so in the language of Alfred Hitchcock and film noir. It’s a bit of a deeper cut than Cabin in that regard. One cannot help to make these comparisons to Goddard’s previous film because the ad campaign seems to be pushing that angle, but Bad Times At The El Royale has something different on its mind, and it helps going in to know that there’s no larger mystery to crack here. That doesn’t make El Royale less fun. Watching these disparate characters bounce off each other is entertaining and a little like watching a chemical reaction to see what happens. We get Father Flynn (Jeff Bridges), suffering from a bit of memory loss due to age but still has something to hide. Then there is Laramie Sullivan (Jon Hamm), a vacuum salesman that isn’t at the El Royale to sell vacuums. We have Darlene Sweet (Cynthia Erivo), a lounge singer trying to make that leap into the big time. Finally, we get Emily Summerspring (Dakota Johnson), on the run with her sister (Cailee Spaeny) from a mysterious cult figure named Billy Ray (Chris Hemsworth). Even the hotel’s concierge, Miles (Lewis Pullman) has darkness in his past. The El Royale, split right down the middle of the Nevada/California state line, holds just as any secrets as its residents, and everything will be revealed during one stormy night. There’s quite a lot of movie DNA in Drew Goddard’s script. One could see Quentin Tarantino’s influence, especially in how all the timelines play out, but Bad Times At The El Royale has a lot of ingredients in it. Alfred Hitchcock, the crime cinema of the 1930s and 1940s, even the advent of late 1960s/1970s rebel cinema are all in the soup. Is El Royale making a deeper commentary on the loss of American innocence? On the changing of the cinematic guard from the optimistic films of the 1950s to the cynical work of the post-Watergate era? That’s for audiences to figure out, if they want to look behind the glass. Or, they can just enjoy the turns that the film takes, and leave it at that. 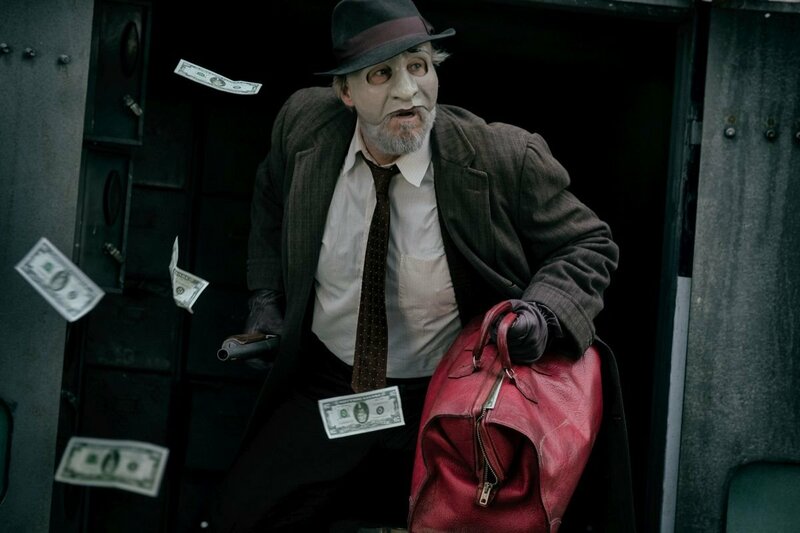 The performances are uniformly good; while on paper this looks to be an ensemble piece, this is very much Jeff Bridges’ movie, and he seems to be having a great time. Also having a great time is Chris Hemsworth as the enigmatic cult leader come to retrieve Emily and her sister. He drips sexuality from every pore, and Hemsworth knows how to be both charming and sinister in his every scene. He’s magnetic and every inch a movie star here. 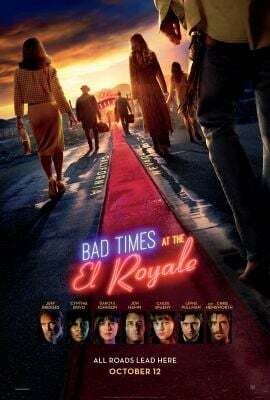 Cynthia Erivo may be the emotional center of Bad Times At The El Royale, and her story the most innocent; Darlene Sweet is in a bad place with some bad people and she has to figure out how to escape, and Erivo is full of compassion but she also knows how to take care of herself. Jon Hamm has always been a pleasure to watch, and his work in El Royale is no different. Even Lewis Pullman’s Miles has something to offer; his bellhop has seen some terrible things at the El Royale, and how all these stories come together is through him. There’s a corruption underneath the smooth, slick exterior of the El Royale, and one could find a metaphor to apply to every story told within its walls. But unlike The Cabin in the Woods, those deeper meanings and themes are more window dressing than anything else. The Cabin in the Woods is a film about why we need horror movies, and the struggles of a storyteller in delivering not just what the audience wants, but what they need. The subtext of Bad Times At The El Royale is not nearly as clear, or as profound, at least at first glance. But I don’t think that was what Drew Goddard was intending, either. I will likely revisit El Royale in the future, but not for any deeper meaning. Instead, I’ll just take in the film’s simpler pleasures – of some wonderful performances, some very well-executed suspense and tension, the terrific soundtrack and cinematography. Bad Times At The El Royale wants to show audiences a nasty good time, and that’s satisfying enough.